Many businesses are aware of the benefits of making the best use of the storage units near them for all sorts of purposes, but one of the most common over long periods of time is for document archiving. This saves offices a lot of time and money in reorganising their working space or looking for other premises, just for the sake of a room of papers that they might need at some undetermined point in the future. Indeed, businesses often have regulatory responsibilities especially in financial areas, where it will be required to keep materials for a length of time. And with the very high level of security offered to items placed in self storage, it is bound to be the most secure option, whether or not you have the space available on your own premises. Finding a good storage deal in your area should be relatively straightforward, and with the direction the market is moving in some companies even offer same day move in. When selecting a room, it’s best to allow yourself some space and ensure that there is some light going into the unit – remember that in many occasions you or an employee is going to have to stand in there and sort through items. 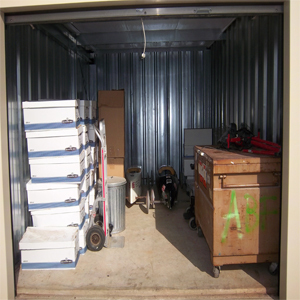 Also discuss with your self storage facility what measures they have in place to control temperature, humidity etc., because it’s no use putting the documents into storage only for them to decay quickly. The best archives are well organised and make good use of space, and yours shouldn’t be any exception. There is a temptation to dump a few boxes in a small room and forget about them, but taking a little time to plan retrieval now will save a lot of time later in rummaging and trying to remember where you put things when you should be working. If you are working out of boxes, ensure that these are practical in terms of weight and dimension, and easy to get in and out of. If you can get a unit with shelves, or put some up, this is ideal as you can make best use of the volume available to you, working alongside the walls as you stand in the centre, and organise filing in more meticulous detail. Just having boxes piled up on the floor makes visits to the self storage more of a bind, and turns the whole process into a dangerous game of jenga. Companies have their own reference systems for keeping tracks of cases and documents, and whilst they should be applied here, it is also worth ensuring that you and colleagues visiting the archive unit can find their footing easily when it comes to retrieving materials. The best way is to devise a plan which you can take with you, that contains an outline of the storage unit with the location of various categories of document, along with a more detailed inventory. Label boxes and files clearly in bright colours that will stand out if the unit is dimly lit. This means that hopefully in theory collecting a file from the archive should be as straightforward as following the instructions on a simple map. Good luck! « How Do Storage Companies Have A Right To Sell At Auction?